Some mistranslations don’t really hurt anyone but can raise a laugh. Of course they are usually caused by a business that has tried to save a few dollars by using an amateur translator. 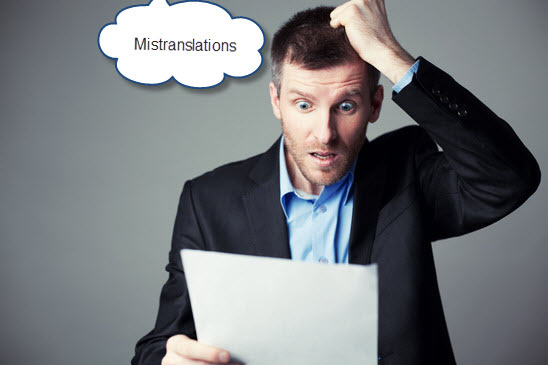 The following are some typical examples where a mistranslation has taken place and it has been noticed and passed on to others. Restaurants are often places where mistranslations take place. One spotted in a restaurant window in Holland said “Don’t stand out there and stay hungry. Come in and get fed up.” A wine appraisal in a Swiss restaurant said “our wines don’t leave you anything to hope for”. A Tokyo bar had on its bar menu “cocktails for ladies with nuts.” A cocktail lounge in Norway made a request that ladies should not “have children while in the bar”. A New Zealand restaurant stated that it opened “7 days a week, as well as weekends.” A Vienna restaurant listed “fried milk, roast cattle, children sandwiches and boiled sheep” on its menu. In a Korean restaurant in Auckland, New Zealand a notice stated that “we don’t re-use our food”. An East African newspaper wrote a news report about a new swimming pool saying that it was nearly finished as the contractors had “chucked in most of their workers”. Sitting around in an airport or even in an airline seat waiting for a flight to reach its destination gives language enthusiasts food for thought when reading some of the mistranslated notices displayed by airlines. On a Korean flight, for example, a notice stated that when arriving at Kimpo and Kimahie Airport, please ensure you are “wearing your clothes”. An Aeroflot advertisement stated that for added comfort it had introduced “wide boiled aircraft”. In a Copenhagen ticket office a notice stated that when your baggage is taken it will be sent it in “all directions”. A Spanish airplane had on its seasickness bags that they were to be used in “cases of sickness or to gather remains”. Shopping can often enrage language enthusiasts or at least make them laugh. In a tailor’s shop in Hong Kong a notice stated that “Ladies may have a fit upstairs”. Additionally, a dry cleaners notice said “Drop your trousers here for the best results”. In a Swedish fur shop a notice stated “Ladies-Fur coats made from their skin”. Signage on roads can often cause confusion if mistranslated, such as a sign in the Philippines which was attached to a car saying “Car and owner for sale”. A detour sign spotted in Kyushu, Japan stated “Stop: Drive Sideways”.